More schedule information: Overnight camps last one week. It's like having your own horse for a whole week! 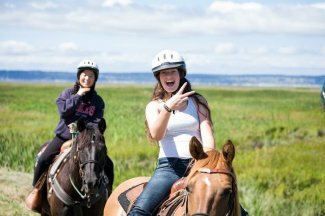 Overnight camp is great for those who love horses and love summer camp! Ride and care for your own horse, learn Western and English riding, enjoy arena lessons, trail rides, vaulting, plus swimming and other fun summer camp activities. All levels of riding are welcome. Overnight Camps are for campers ages 10-18. Camps are week long overnight camps that begin on Monday and end on Saturday.